Came across some picture book versions of Cinderella that have delightfully modern twists to them! 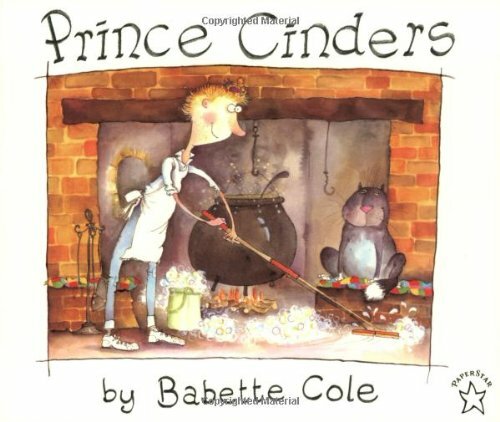 Prince Cinders by Babette Cole features a gender bent story in which a male hero is bullied by two brothers. For all the action heroines today, I think what we really need to make feminism more well rounded is to now show males that it's okay for them to step out of the traditional male stereotype. 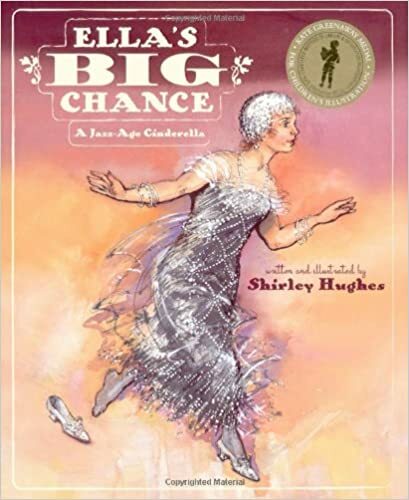 Ella's Big Chance by Shirley Hughes is set in the jazz age. This time, instead of a teeny tiny heroine with big ugly stepsisters, Ella has a more typical body while her sisters are really skinny. Not only that, but she rejects the duke's proposal because she is in love with another. 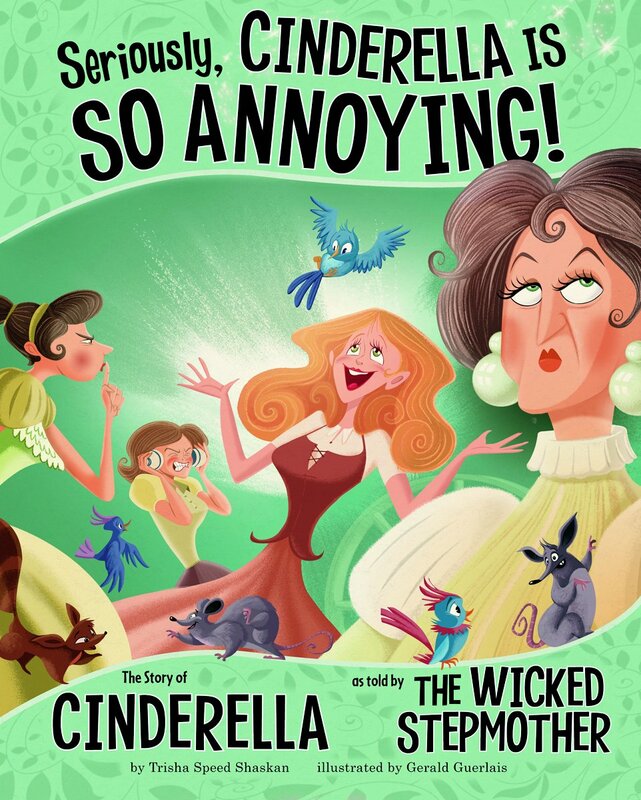 Then there's, "Seriously, Cinderella is SO Annoying", part of the Other Side of the Story series that retells classic fairy tales from a different character's perspective. This idea is fairly popular now, especially with Disney's "Maleficent" being such a huge hit, but it's still probably a fresh idea for most parents and kids when it comes to Cinderella. Cinderella children's books out there that provide a fresh look at the story? 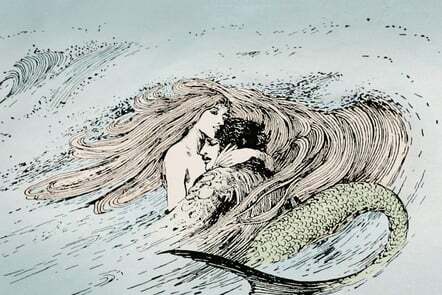 Reader Julia Mavroidi alerted me in the comments that there is a free online course available this fall on the fairy tales of Hans Christian Andersen! I'm not sure if I'm willing to give up the 4 hours a week it would take but I'm intrigued...has anyone taken classes through FutureLearn before? If any of you take this class, let me know what you think of it! More information here, it starts October 19 for only 6 weeks. 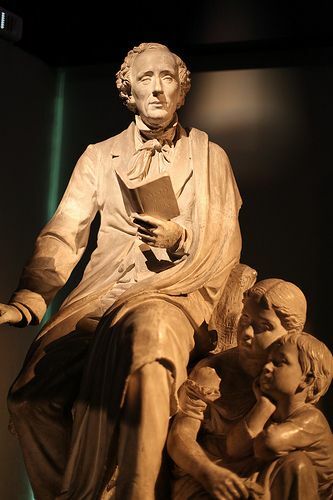 This free online course will introduce you to some of Hans Christian Andersen’s most popular fairy tales, share the story of the writer himself, and discuss his cross-cultural importance today, as the inspiration behind many popular books and movies. 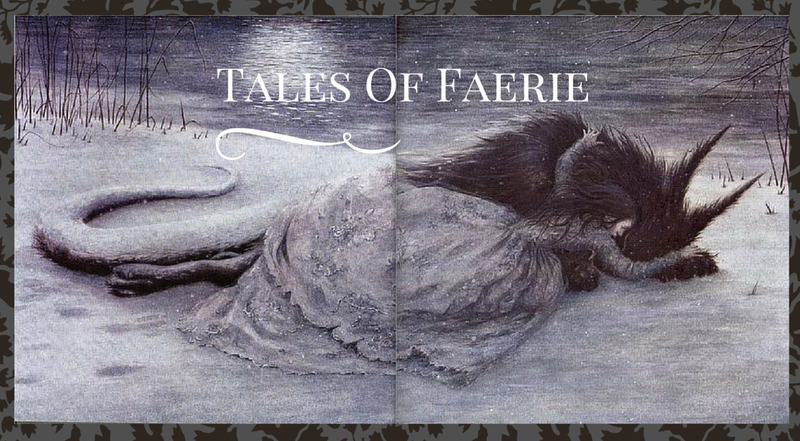 You will explore the themes of each story, and investigate how they both conform with and digress from the fairy tale. 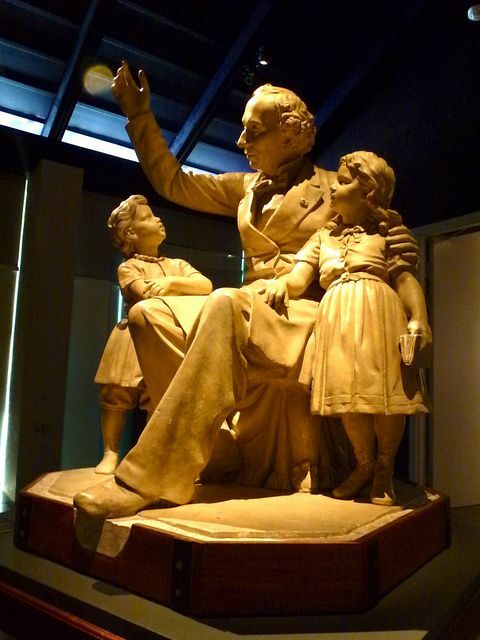 This genre became very popular in the period of literary history to which Hans Christian Andersen belongs, Romanticism, when childhood was discovered as an age that is important in its own right. 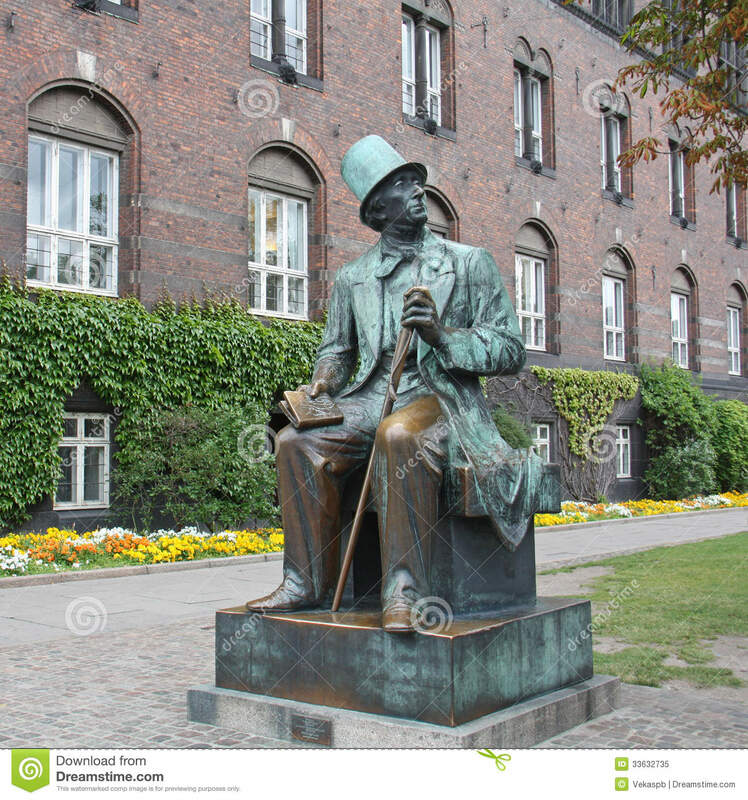 But what Hans Christian Andersen did with this genre is absolutely unique - there are no other writers of fairy tales like him. When the Schonwerth tales were released in English, one of the selling points of the collection was that you could compare a version of "The Valiant Little Tailor" with the Grimm story about a man who kills seven flies and tricks his enemies into fearing him using clever wordplay (or lying, depending on how you look at it). "One example in this book is a version of the well-known story of “The Valiant Little Tailor,” the guy who kills seven flies with one blow. The Grimms’ version has the flies hovering over a sandwich that the fellow has made. In Schönwerth, the flies are hovering over a dung heap. So that gives you a sense of the raw energy of the stories and the way that Schönwerth decided he was going to tell it straight up, tell it like it was." But in my copy, the story that is clearly the "Valiant Little Tailor" version, "The Tailor and the Giants," there are no flies at all, and no dung heap. The tailor just happens to come across a sash (by a well in a forest) that says "Seven with one stroke; who can match that?" and takes it; rather than the Grimms' tailor who sews the sash himself, making him seem a little more full of himself. The episode where the tailor fools the Giant is similar in both versions-they both squeeze a piece of cheese to appear strong enough to squeeze water out of rock, and they both release a bird pretending they can throw a rock even farther than the Giant. Yet the Grimms' tailor had happened to find those objects before he met the Giant, whereas the Schonwerth tailor picks up the objects as he goes. The Grimms' hero appears to be just lucky, whereas the Schonwerth tailor is thinking on his feet and appears more clever. There is an episode in the Grimm story not found in Schonwerth, in which the tailor also pretends to help the Giant carry a tree. There are other minor differences I won't go into, but just highlight the ones I find the most significant. In both stories, the tailor is eventually charged with killing troublesome giants. 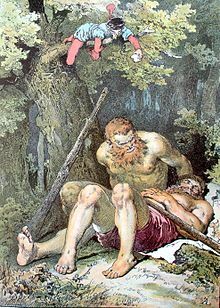 In Grimms, they appear to be two completely unrelated giants-the King has to show the tailor where they live, and he tricks the giants into getting into an argument and killing each other. Yet Schonwerth makes it clear that the tailor kills the very Giants that he had just stayed with, and he was able to do it because he already knew where they lived and their schedule. After cutting off their heads, he also cuts out their eyes and tongues as proof for the King. Then, Grimms' tailor only has to secure a unicorn and a boar before being able to wed the princess. Schonwerth's hero is charged with killing seven Dragons that demanded daily human sacrifices, and a Serpent who would eat any humans that came near. Certainly more intimidating foes. Then, in the middle of the tailor's slaying, he notices that the words on his sash have changed-now they tell him the secret to killing the rest of the Dragons. I like that element that the sash is a magical helper. In both stories, the tailor wins the Princess that was his prize for his feats. She overhears him talking in his sleep about sewing, revealing that he was a tailor (a very lowly position at the time). The Princess tells the King she doesn't want a husband who was once a tailor. The Grimms' King promises to capture the tailor and ship him off across the world. The Schonwerth King was more violent-he arranged to place his new son in law at the front of an army in a doomed battle. But once again, the tailor looks down to see that the words on the sash have changed a third time, to say "You shall be the victor!" The tailor happened to come across a crucifix, and the sight of the "God of the Christians" fighting with the tailor's army caused the other army to flee in terror. The Grimms' tailor just pretends to talk in his sleep again and threatens the King's servants who run away before shipping him off, so he stays King and nothing is said about the Princess' feelings changing towards him. The Schonwerth tailor returns to his wife who now respects him and they both lived long and happy lives. 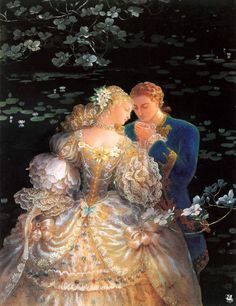 The tale of Cinderella is often looked down on for being shallow and materialistic; Cinderella is only beautiful when she's in a dress, and the prince only likes her because she's beautiful. But I think we have to remember how significant the class difference was between Cinderella and the Prince, and how truly big of a deal that union would have been hundreds of years ago. Even today there are some circles where it's really important if you come from money; but those class distinctions and judgments have grown much less significant. Especially here in America, where we tend to respect people more if they came from nothing and worked really hard to get where they are. But the lines between royalty and servants were so untouchable we lose sight of the sacrifice the Prince made in being willing to marry Cinderella, a servant, even though she was found in her rags. It wasn't just her physical appearance, it was her station in life. The Prince instructed the shoe was to be tried on everyone, not just nobles and royals. It's interesting to compare Cinderella to the Villeneuve version of "Beauty and the Beast"-the whole thing is almost a parody of the class system, because she shows people judge others who aren't "good enough for them" (the Beast's/Prince's mother does not approve of Beauty, a commoner), then we find all the expectations of classes being turned upside down-in beauty verses ugliness, wealth verses poverty, royalty verses peasant, even fairy verses human. In fact, I would argue that physical appearance is now one of the things we tend to judge other people by the most. It's almost our new version of ranking by class. I like to think that a modern version of Cinderella in the same spirit would be something like: a guy and a girl meet at a party, and he finds her very attractive and never forgets her. Years later he finds her, but now she has gained a lot of weight or in some other way become not as beautiful by cultural standards-yet he knows she is the same person from that party and because he fell in love with that girl he wants her no matter what. It can be read as a love that transcends cultural rules rather than falls into them, we've just morphed our rules a bit. Love at first sight in French Salon Fairy Tales is not the complete solution, but it was a step towards solving the problem of marriages that were arranged only for social status, regardless of the feelings of the people who would actually have to enter into that marriage and have their lives forever changed. 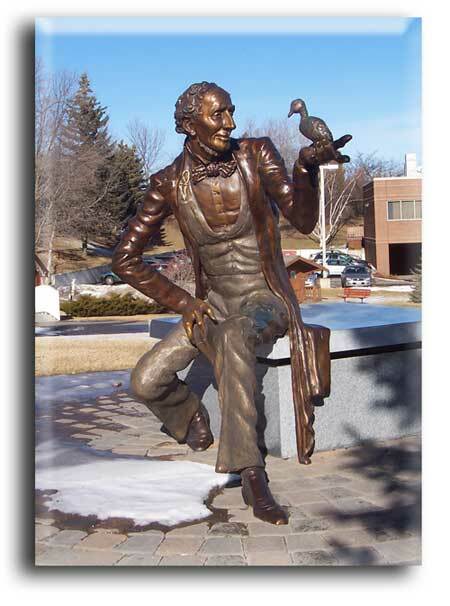 From passport couture: "I never expected Hans Christian Andersen to be in Chicago, but I'm excited to run into him." I never expected to run into HCA in Chicago either, and I live here!! Well, not in the city proper, but I've lived in the Chicago area my whole life. I need to get to Lincoln Park at some point and see this in person! 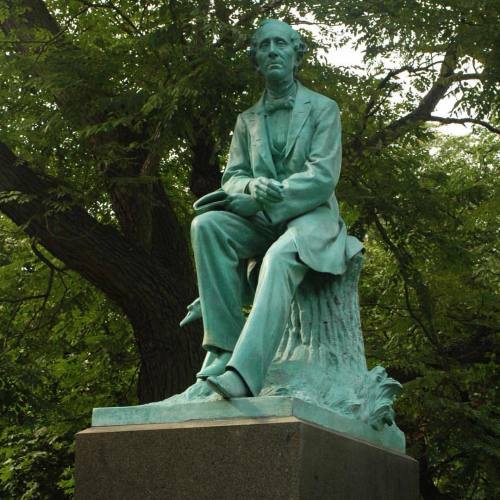 "Soon after members of Chicago’s Dania Society suggested that the city should erect a monument to Andersen in 1891, a committee formed and began raising money for the eight-foot-tall bronze sculpture. Donations included pennies and nickels from school children. 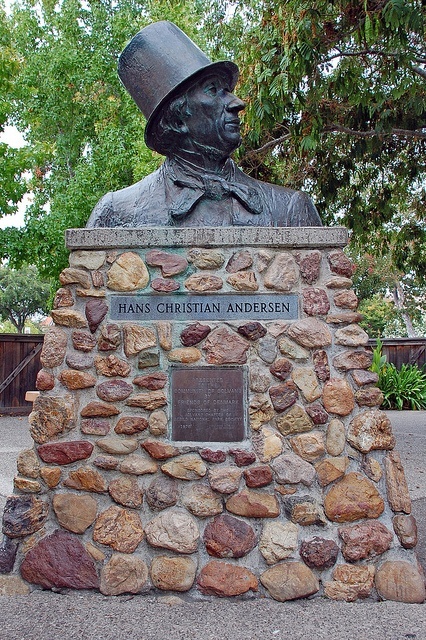 The Hans Christian Andersen Monument Association hired Danish sculptor John Gelert (1852–1923), who had arrived in Chicago in 1887, and received his first commission for the Haymarket Riot monument (which was later considered controversial). Gelert later explained that “he had the advantage of studying several good photographs of Andersen taken at various times in his life.” Gelert portrayed the children’s author sitting with a book in hand and a swan at his feet, alluding to his world-famous story." And apparently, this sculpture in Odense was going to be drowned in a harbor?? This time without a duck and with a snail...and whatever that is on his back? Am I a bad fairy tale blogger if I don't know what the snail is from? 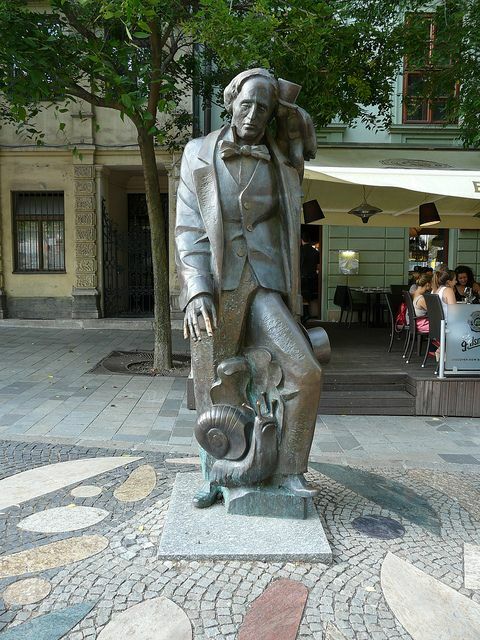 Out of curiosity, I tried to find other statues of the brothers Grimm to compare. It seems that they are most honored in monument form in Germany but not outside. (Let me know in the comments if I'm wrong!) Isn't that interesting, though? The Grimms are arguably more popular, is it just the cost issue of having to do both brothers verses one HCA? A reader sent me a link to this article When Cinderella Fought the Spanish Government by John Witiw. 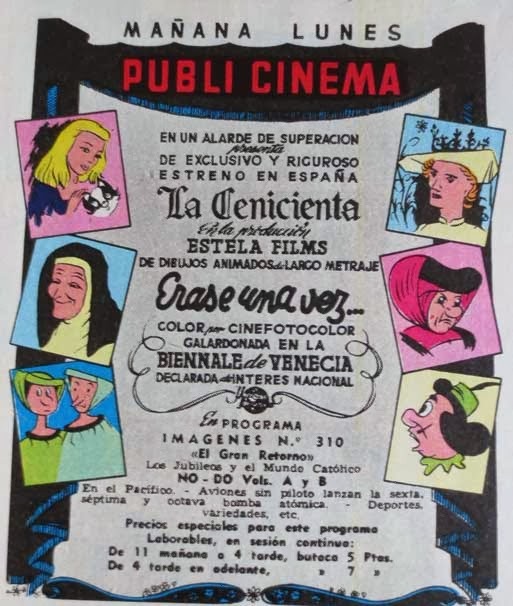 "Titled Erase Una Vez, or Once Upon a Time, Spanish film company Estela Films attempted to tell the story of La Cenicienta, or Cinderella, as an animation the same year that Disney released theirs. For years, it was considered to be a lost film, but a black and white version of the original Cinefotocolor film has been uncovered and clips have been released on YouTube. Coincidentally, both films heavily used rotoscoping (the practice of drawing over live film) to produce life-like animation, as seen below." Click through to the article to read more about how this film compared to the Disney, and how Disney's success put this film into obscurity. "When it was released, it won a ‘Menzione d’honore’ in a Venetian Film Festival where it was said to be recognized as best children’s film. It was also deemed worthy of national interest. However, Disney’s success globally eclipsed the ambitious little picture. Even Spanish critics thought Disney’s version had better technical animation and it was unable to make up its budget of 5 million pesetas. The failure is believed to have killed Estela Films’ animation department, cancelling an upcoming film called Viaje Fantástico"
But there were even issues coming from the Spanish government at the time. I don't understand the particulars of the politics, but censorship from home also hurt the film's success. Anyone in the Portland, Oregon area? The show "Wolves and Wonders" by artist and author Emily Winfield Martin is coming to Land October 9. Via her blog, The Black Apple, Martin shares: "The show was inspired by Angela Carter, variations on Beauty & the Beast, the East & the West...lots of things. Stay tuned for more lions & tigers & wolves & ladies!" Definitely sounds like it's something a fairy tale fan would enjoy seeing! Martin has also hinted that she's got a novel in progress that would be based off of her favorite fairy tale, which is "Snow White and Rose Red." She's also hard at work with her art and children's books so I don't know when that would be coming out, but that's a fairy tale you don't get in novel form very often! I'll be keeping my eye on her blog to give you more news about that. Shyamalan's The Visit-Fairy Tale Horror? "This does, however, have elements reminiscent of a modern day fairy tale—that scene of the grandmother asking the young girl to get in the oven is straight out of Hansel and Gretel, all she needs is a house made of sweet treats. That part is definitely right up Shyamalan’s alley, and gives this the potential to be a kind of synthesis of the no-frills horror of Blumhouse and Shyamalan’s sense of magical realism." You can read the basic plot on wikipedia if you don't mind spoilers. Sadly, it doesn't seem to have too many fairy tale connections other than the mention of the oven, and the fact that it's a brother and sister in a creepy house. But Rule #2 below seems suspiciously witchy...maybe there are other little details hidden throughout the film? 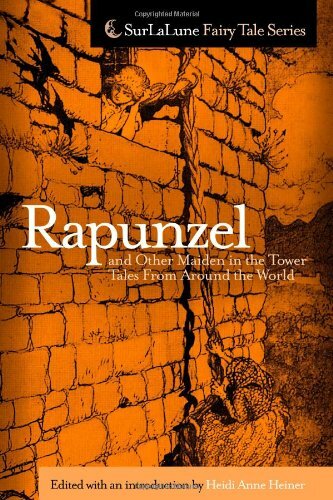 In Surlalune's fantastic collection of Rapunzel tales throughout the world, Heidi Anne Heiner includes a small section of Maid Maleen tales. "Maid Maleen" is one of the tales in the collection of the brothers Grimm, and it's related to Rapunzel in that it includes a young woman imprisoned in a tower. However, Maid Maleen is imprisoned not by a witch, who can be seen as an overprotective mother figure, but her father-for she is in love with a man her father does not approve of and refuses to marry the man he chose for her. As punishment, her father imprisons his daughter and her maidservant in a tower-yet this one appears much more terrifying than Rapunzel's tower. She and her waiting woman are walled in it, almost like being buried alive-they have no light and the walls are too thick for sound to come through. They were left with enough food for seven years, and the father promised to return and see if he had weakened her resolve. Only no one came at the end of the seven years. Realizing they might be left alone, Maid Maleen suggests they try to break out using a bread knife (why didn't they try that at the beginning of the seven years?). The women discover that the land has been destroyed and her father is gone-they take employment as servants at a palace that just so happens to be where Maid Maleen's former lover lives, but he is betrothed to another, ugly, wicked woman. Maid Maleen drops a series of hints at who she is as the wicked bride forced her to take her place at the alter, for fear she will be mocked because of her ugliness. I'm not especially impressed by the Prince's lack of efforts to get her out of the tower in the first place, if she could make a hole with a bread knife, or at how slow he is to get the hint, but of course at the end he discovers the truth, is married to Maid Maleen, and the wicked false bride suffers the punishment she intended for Maid Maleen-beheading. 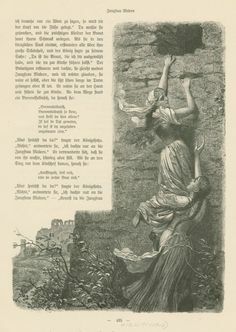 If that tale is dark, "Princess Who Was Hidden Underground," a German tale recorded in Andrew Lang's Violet Fairy Book, is even more depressing. The father in that one builds a palace for her underground, simply because she has grown up, and killed the architect who built it. He declared that anyone who could find her could marry her, but many died in the attempt. 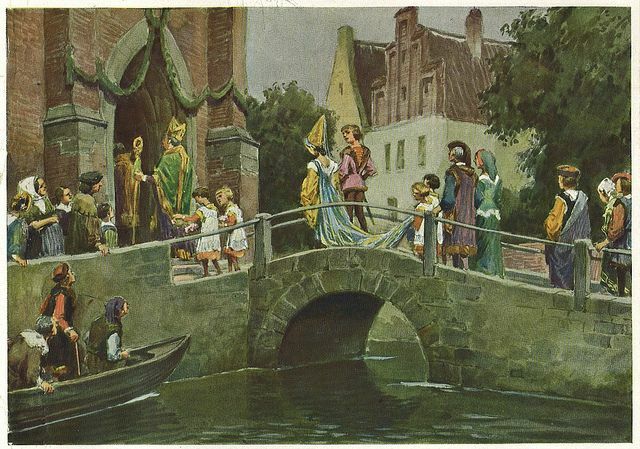 And even in this he was not honest, for once the hero of the story had found the Princess (by disguising himself as a lamb to be given to the Princess as a gift), there is an additional trial: the hero must identify the Princess even after she and her maidens have been turned into ducks. Fortunately, the Princess knew of this, and arranged a signal between herself and the young man. Finally they defeated the King's evil plot and were able to marry. My favorite was the last, "The Girl Clad in Mouse-Skin," a Danish tale. In this one, the father is not evil or controlling-he simply creates a safe house where his daughter can hide while he goes away to fight in a war, and she is not locked in. After seven years, the young woman leaves and finds that her father died nobly in battle. Like Maid Maleen, she finds work as a servant in a Prince's Castle. Yet the Prince's betrothed is not evil or ugly-she (like Maid Maleen) is in love with another, whom her father has forbidden to marry. The women mutually agree to switch places at the Prince's wedding, and both women end happily married. I like that in this series of tales, the heroines prove to be their own agents of change-you can't accuse these ladies of waiting around for a Prince to save them, they escape and get husbands using their wits. Another fairy tale stereotype is to pit female characters against each other-mothers/stepmothers or sisters are the villains. There aren't too many fairy tales with males as the villain, and even in common tales like Donkeyskin, he is never really punished and the blame too often gets put on his first wife. What do you think about Maid Maleen tales? Read these stories for yourself, Heidi Anne Heiner has made text available through the Surlalune website! good, then she could help repair her family's dysfunction. She eventually learned that striving for good behaviors didn't seem to have any affect, and she gave up and embraced the same tools her family used to deal with things-alcohol, drugs, and cigarettes. Ella's life became a roller coaster of visiting rehabs and relapsing. She eventually ended up in a foster home. The family she lived with was so different from her own, she didn't feel like she fit in. Her foster siblings were too "perfect," they couldn't possibly understand what she had gone through, the decisions she had made, or what her world was like. Once again, Ella found herself in need of rehab. She chose a program in a more violent neighborhood in Chicago, because it would be shorter than the alternative. She found herself a racial minority, not really benefiting from the services the rehab provided, and not fitting in with the other girls. On certain Saturdays, the girls were allowed to go out with friends or family members. Her foster parents would drive out whenever they could, taking her home for a day, or for adventures in the city, seeing major league baseball games or visiting Chinatown. One Saturday promised to be only a brief visit-the family had RSVPed to a wedding in the late afternoon. Ella had never been to a wedding before; she wished she could go with her foster parents, but she wasn't on the guest list, and anyway was only dressed in jeans, not appropriate wedding attire. But, her foster parents called the family who was hosting the wedding to see if Ella could come with them to the ceremony; the hosting family would be thrilled to have Ella there. The foster family was on a mission. They didn't have much time; Ella and her foster mother ran into a clothing store while her foster sister went into the beauty store next door to pick up makeup. Ella found a dress right away, tried it on, and wore it out of the store. There was a palpable excitement in the family van at this sudden change of circumstances; Ella put on her new makeup as they drove to the ceremony. The wedding was beautiful, but it was over all too soon. The wedding party went to take pictures, and the rest of the guests were making their way over to the reception venue, but Ella had a 6:00 curfew at the rehab facility, so they left for the city of Chicago again. The foster family would still be able to return the party, feast, and dance, but Ella was going back to her life of drudgery. She grew sullen and wouldn't speak during the car ride. She changed out of her new dress in the back seat of the van, rolled it up, and hid it as she left the van, back to the walls of her prison. Several years passed. The road was a long and difficult one for both Ella and her foster parents. She made some poor decisions along the way, but also faced hardships many people can only imagine-homelessness, abuse, and the constant temptation of family members who dragged her back down into addiction. But through it all, her foster parents did what they could to help her. They stayed in contact after she turned 18 and was out of foster care. They helped her find jobs and housing, study for her GED, and gave her innumerable second chances. This weekend, Ella wore a different kind of dress-a beautiful, lacey, white wedding dress. She is drug free and the mother of two beautiful children. She is now the strong one who sets an example for her family members, and gently guides a drunk friend back home. She and her husband could not have afforded the cost of a wedding, but once again, her faithful fairy godparents were there to help with details of venue and flowers and food and ceremony. She beamed as she echoed her marriage vows and placed a ring on her husband's finger. I share this story, although it's unusual for me, because I hope it's an encouragement. There are so many people who, like Ella (whose name has been changed for privacy), seem to have been dealt life's worst cards. Life can seem incredibly dark and hopeless. If you or a loved one struggled with substance abuse and/or other struggles, it can seem like there's no way out and no point in trying, but it is possible to turn a life around. Fairy tales don't have happy endings because we're trying to propagate the false idea that life is easy or perfect; (most) fairy tales have happy endings simply because we know all too well that life is not easy or perfect. It will usually take a little more than a dress and a night of partying to change a pattern of behavior, it may take years and much discouragement-but a fairy tale is a way of looking into the future and seeing what could happen. I also wanted to recognize the sacrifices that countless foster parents and adoptive parents are making all across the world. They open up their homes and hearts with no guarantee their efforts will be appreciated or successful. I have a huge amount of wonder and respect for the love and forgiveness my parents have shown Ella and their other foster children through the years; I honestly don't know if I could ever do what they have done. I hope it's also encouraging to realize that we can be that fairy godmother to someone else. It doesn't have to be something as extreme as long term foster care-sometimes a smile and listening ear can do wonders in the life of someone who is lonely and hurting. Whether we realize it or not, our words and actions (or lack thereof) can change someone's life-that's a huge responsibility, and a privilege we should not forget or take lightly. This weekend I saw my father walk Ella down the aisle and dance the father/daughter dance with her. At the time she lived with us I would never have predicted that she would honor us as her family in this way. I'm thrilled for Ella and wish her an epic Happily Ever After-not that it will be perfect or easy, but I do think it will be full of love and happiness all the same. "No story was just a story, though. It was a suitcase stuffed with secrets." 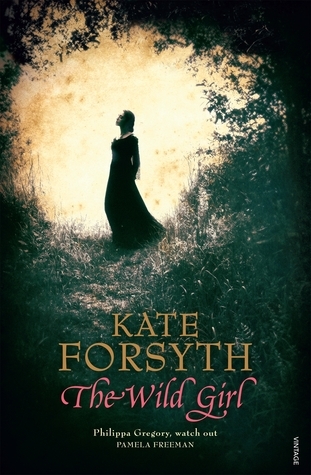 I was thrilled to find my library already had Kate Forsyth's latest book available! (Well, in America-The Beast's Garden is already available in Australia.) I was expecting to enjoy The Wild Girl and I was not disappointed! 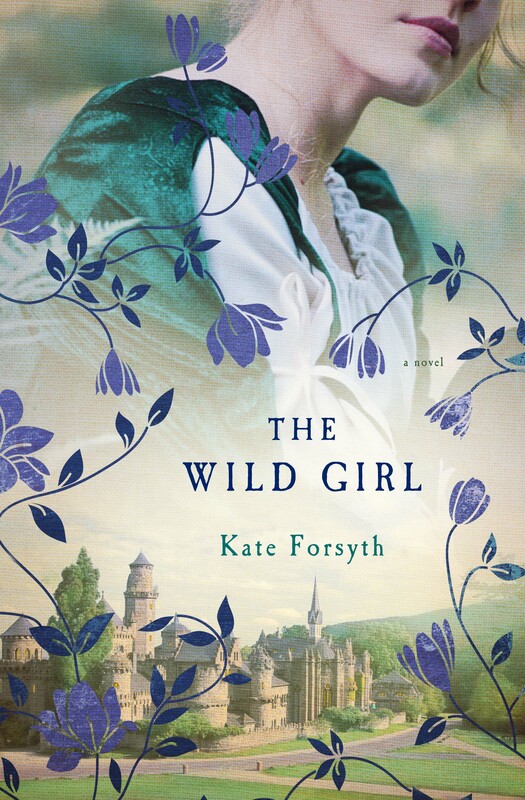 It's a beautiful story about Dortchen Wild, the girl who grew up next to the Grimm family and ended up marrying Wilhelm Grimm, as well as telling him many of the most loved tales featured in the collection. My favorite thing about Forsyth is how committed she is to research and historical details. Obviously she had to take some creative liberties-very little research exists on Dortchen Wild, which is a shame. For all the books published on the Grimms, for collecting and editing the tales, the significance of the original teller shouldn't be overlooked. Yet even though Forsyth had to use her imagination to fill in some gaps of knowledge, I think she did a good job of remaining true to what is known rather than twisting facts to make for a good story. In fact, towards the middle of the book, I was beginning to think it was a little excessively dark. But Forsyth also includes a fantastic afterword that explains the questions I had been asking as I read-how much of this is historical and how much was invented? I don't want to give anything away, but I think she came up with a good explanation for some of the mysteries that surround Dortchen and her relationship with Wilhelm. But fun facts (from the afterword): the real Dortchen had written a letter to Lotte Grimm when she was 12 confessing her crush on Wilhelm. They weren't married until 1825, but in his autobiography Wilhelm wrote: "I have never ceased to thank God for the blessing and happiness of this marriage." The book is historical fiction, fairy tale, romance, coming of age, a war novel, a study of a troubled family-it's so many things rolled into one. And aside from the story, I'm glad I read it just for the information I learned and can now remember better. I've read multiple books on the Grimms before; I've read about the different people who likely told them the stories, the people who helped them publish the books, the tendencies of each brother when editing-but those are all details I didn't necessarily remember or keep straight in my head. That's the power of a novel-not only did I read a very sweet romance, but now I feel like I have a sense of the difference in Wilhelm's personalities verses Jakob. I've read before about the Napoleonic invasion and how that motivated the brothers to collect tales that would be true to their German heritage, but I really had no idea what that would have been like (Napoleon wasn't really covered in my American education...I think we had one semester to gloss over all the major European monarchies). It's been typical lately for critics to get upset about the changes the Grimms made to the tales and how they were made less authentic. But when you read the story, you can easily imagine why they would have made those changes. Responsible for providing for their family during a very hard time, they needed money and couldn't have months of work go to waste if no one would buy their books. The Grimms often went hungry (literally-not just "it's been 5 hours since I had lunch and I'm so hungry", but "I've had to live off of small amounts of cabbage soup all winter and we don't have coffee so we grind acorns" hungry). Also, seeing the stories through Dortchen's eyes, I couldn't help but think of those who are upset that traditional fairy tales feature more passive females who are rewarded for doing housework. I think sometimes we almost get the idea that fairy tales were made by a bunch of old white men sitting around and thinking of stories that would "put women in their place", but you see that the tales really reflected the lives of the women who told them. Life was hard-no man would think of doing any of the "women's work" around the house, and the women were responsible for all of the household chores in an era before dishwashers, refrigerators, washing machines, etc., no matter how many women there were in the house (the Grimms had one sister, Lotte, who was expected to take care of all of them all by herself). The women in the story didn't have to pretend too much to relate to Cinderella, or even the extreme hunger in "Hansel and Gretel," or some of the trauma found in other fairy tales. Stories were (and are!) a powerful tool for people to express frustration, communicate experiences, and hope for the future. I loved hearing some of the tales told in their original forms. As much as I would love to get my hands on the First Edition of the Grimms' Tales, many of the tales were changed even from the original telling to that first edition. Of course there were reasons for that, one being that the brothers often heard multiple variants of the same tale and didn't want to be the book to be too repetitive, so they would create a "master" version. Dortchen's father is a huge character in the book. He begins as strict and unforgiving and becomes crueler. There were difficult scenes to read that made me truly upset and angry. I think on some level, Herr Wild represents the worst case scenario for Victorian fathers-one that, sadly, wasn't far from the truth in many households. I do wish that Forsyth had included a little more insight into his character and how he became the way he was-villains rarely appear out of nowhere. Very likely he too was beaten as a child, which influenced how he saw his role as a father; or maybe other characters could have shown disapproval if he failed to properly "manage" his wife and children. Males were way better off than the average woman at the time, but there were still strict social rules that dictated what was expected of them at the time. I had never really considered what it would be like to be a male in the Victorian era-to go from being in absolute submission to your parents, to getting married and all of a sudden being in absolute authority of your wife and household-it would naturally be very confusing and easy to turn into a tyrant. This book, like Bitter Greens, is for a more mature reader. Some of the scenes are very dark, and there is sexual matter. In comparison, "Wild Girl" is less explicit, but there are still some very sad, even scary scenes (I made the mistake of reading this before bed one night-didn't sleep well), and violent descriptions of her brother's experience fighting in the war. I had read Gyspy's interview with Kate Forsyth at Once Upon a Blog but reread it after I finished the book, since many of the details make more sense to me now. I would highly recommend the interview for another read, I enjoyed it so much more after reading the book myself! Bonus: Sue Bursztynski interviewed Kate Forsyth back in 2013 to discuss both "Bitter Greens" and "Wild Girl." Thanks for sharing, Sue! This cartoon by David Ebanez Bordallo from Spain won second place in a Gender Equality cartoon competition; the title 12 Comics That Sum Up How Men and Women aren't as Equal As You Think is definitely provocative. And if the wolf represents man, equality doesn't mean "subduing" him either. Maybe I'm just reading too much into it...I definitely love a good female superhero. Bordallo's quote below indicates that he sees the "conquering" as more symbolic than literal. Still, I don't know that it should win second place in a contest sponsored by the United Nations Women. But if nothing else the cartoon shows that we still tend to perceive Little Red Riding Hood as traditionally about a young, naive girl being taken advantage of, and the concept of her conquering the wolf as novel...when really, this concept isn't new at all. Many modern versions of Little Red Riding Hood play with the stereotype, but we keep forgetting that even in the Grimm's version of the story, after an unfortunate first encounter with the wolf, Riding Hood and her grandmother learn their lesson and outwit the wolf all on their own. *Maybe* this cartoon is a reference to the fact that we are already redefining fairy tales, because they are really about SO much more than passive females being rescued by men. But I kind of doubt it. "Gender inequality represents one of the biggest challenges of our times. As a teacher, I believe in the power of education to change things. I hope that with proper education, creativity, and sense of responsibility future generations will be able to move more strongly in solving this and other problems that compromise sustainability and human happiness: I firmly believe in children's superpowers to overcome barriers that currently seem almost impossible to overcome."